This Kitchen Design and Renovation in New Farm features an illuminated dining table made from Caesarstone’s Concetto. This challenging Kitchen Design by Sublime Architectural Interiors blends modern interiors with turn of the century architecture. Using both neutral tones and strong natural elements ensures the external design of the home does not overshadow the interior. This modern design can be applied to create airy, open plan spaces that reflect how we live today.Another key feature in this Brisbane Kitchen Renovation in New Farm is the integration of all the spaces. The wall that separates the ancillary spaces of the powder room and pantry from the kitchen is clad in textured laminate. The doors to enter these spaces are designed to sit flush with the surrounding panels so they conceal the opens. On this wall also sits the Liebher fridge that is integrated as well as the wine and beverage centre which acts as a bar. Open plan design – Unlike building a new home, restoring an older building has challenges. The home owner wanted very open spaces but there were some restrictions structurally to be incorporated in the design planning. The client was looking to breathe new life into a derelict set of flats by raising the building and transforming it into a new triple storey home. The owner loves entertaining so wanted to create a living space that would embrace their lifestyle of entertaining friends and clients and love of the outdoors. Cooking is a key aspect to their lifestyle, so regularly catering for up to 15 guests on a weekly basis, meant that this became the focus of the design. However, the home owner wanted to stay connected with guests while cooking and have an island in the kitchen that would form the centrepiece and hold the whole space together. A large Smeg oven designed for entertaining and the Billi Tap, with hot and cold and sparkling water on tap, were incorporated into the space to help it transform from day to day to party central. Due to the size of the block of land and location, the home owners were also wanting to build two luxury town homes at the rear of the block so this needed to be taken into consideration when planning window placements. The positioning of the splashback window was determined by this plus its the eastern position with much valuable morning sun being captured in this direction. The splashback window still allows light to penetrate but restricts the view of the neighbouring homes. Mirrors were then used above the overhead cupboards on this same wall to help reflect light back into the space. Neutral colour tones and linear elements such as aluminium channelling have been used to draw the eye around the space, indoor and outdoor combined, plus to give the design features a chance to shine. The key feature of the entire space is the booth seating. Anchored on the back of the centre island, this seating is causal for day to day use but the can seat up to four during entertaining. It gives a lounging feel and allows the chef to remain a part of the conversation whilst entertaining. This feature is then matched with the focal point of the design, the illuminated dining table made from a piece of Caerstone’s Concetto range. This table is fully backlit with RGB LED strip lighting. Colour controlled with an app that can be used on your iPhone or iPad. Just this feature alone gives this space a real sense of luxury and diversity and is able to seat a number of guests during entertaining. The built in outdoor barbeque with integrated seating connects the indoor outdoor spaces giving continuity and flow. Laser cut metal screening has been used to filter the view between dwellings and create privacy. The vertical garden brings the outdoors in and can also provide the chef with fresh herbs when required for cooking. Another key feature of the spaces is in the integration. 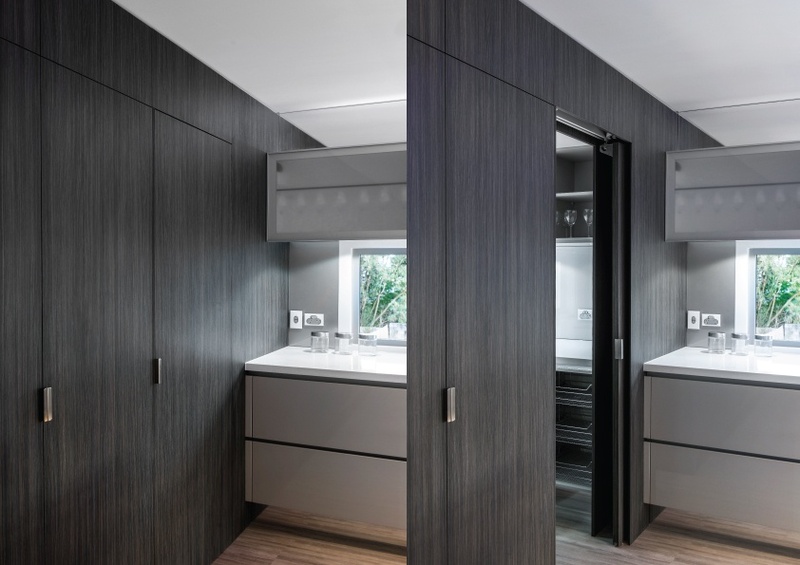 The wall that separates the ancillary spaces of the powder room and pantry from the kitchen is clad in textured laminate. The doors to enter these spaces are designed to sit flush with the surrounding panels so they conceal the opens. On this wall also sits the Liebher fridge that is integrated as well as the wine and beverage centre which acts as a bar. In lighting the space, feature lighting was created by the use of pendants to draw the eye up and around the space. LED downlights have been placed in the underside of the all overhead cabinets to illuminate the task driven areas of the space. Complementing the natural light created in the space during daylight hours, more downlights are used throughout the ceiling to ensure there is plenty of ambience at night. Blending modern interiors with turn of the century architectural is always a challenge. However, use of neutral tones and strong natural elements can ensure the external design of the home does not over shadow the interiors. Modern design can be applied to create airy, open plan spaces that reflect how we live today.